Choose your parent plant and label the stem with variety and type. Take off the last of the petals or wait for them to fall. Leave the seed head on until it is dry and ready to take off the plant.This can be helped by squeezing excess moisture from the head. Cut the stem about 16inch long with the label and leave to dry for a further couple of weeks. When dry and loose you are ready to take the seed from the dry head . 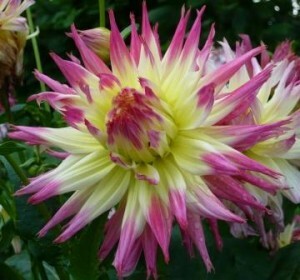 The black seed can be packed in to packets with the name and type of one Dahlia parent. By saving seed this way you do not know the cross pollinator or what you will get. Be selective when you have many plants to choose from next year. For fun you can name the new variety but commercially cultivated varieties must follow naming protocols. With luck you will be happy with the result and encouraged to try again next season.